Call, stop in, or check out our Facebook Page for the most up to date info on our pre-owned selection. 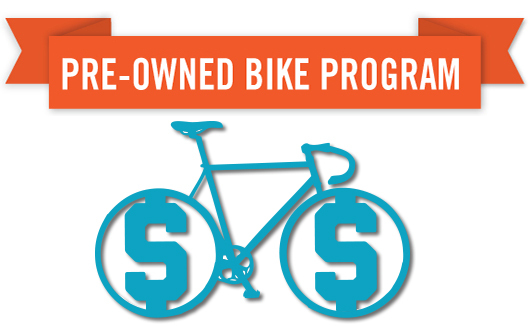 We’ll take your bike and give you store credit for the value of the bike. • We do a 40 point Inspection by trained staff to assess the value of your bike. • Your appraisal takes 30 minutes-one hour. • Once we have established your value, you have seven days to accept the offer. After seven days, the bike must be re-appraised. • If you accept the offer, you will be given a store credit for the amount of the value of your trade-in. • A photo I.D., phone number, and email address will be required to begin the appraisal process. • Evaluation is based on age of bike, condition, amount of service needed, and market trends. • 10 year age limit on most bikes. • We accept bikes that are in good operating condition—no broken bikes. • We accept bikes purchased from bike shops. No department store or big box bikes. • We cannot accept bikes with structural issues. • Estimates cannot be made over the phone. We sell pre-owned bikes that meet our standards of quality and condition. • 10% off service labor for life of the bike. • 15% off accessories at the time of purchase. • 2 year service program: $100 for 2 Tune-ups for 2 yrs.